Today I had to get up super early for me as the Humane Society of Western Montana was having a free rabies vaccination day to celebrate World Rabies Awareness Day. I needed to get two of my dogs revaccinated and since the vaccinations were free, I decided to have it done. This required me to get up early to get to the Farmer's Market. This did two things. First, it got me to the Market early enough to get raspberries and blackberries, but not early enough to get the cheese ends or the bison mock tenders. Second, it got most of my errands done by noon and we were able to get to the vaccination spot with Mishka and Kira (Haegl had already gotten his vaccinations earlier and Kodiak is really too old and decrepit to transport). Despite being on a budget, the blackberries and raspberries from this one farmer are awesome and worth the price. I broke down and bought a mini-flat. He had told me he had lost most of his plants due to a frost in October last year and was picking what was left. What was left were very wonderful berries and worth it. I got some butter ends, butter, cheese (at full price), celery, potatoes, carrots, tomatoes, salad mix, ground bison, beef mock tenders, bison cross-rib roast, strawberries and apples. My birds are raised in my barn. They're touched and handled kindly. They have plenty of space to be birds, with perches, nests and space. They get lots of treats. Today my birds got honey-o melon rind and seeds, apple cores, corn on the cob, rice, carrot tops, celery leaves, bread heels, shortcakes and strawberry hulls. This is on top of the layer feed and oyster shell they get daily. When they are slaughtered, we take them outside and out of view of the other birds so they aren't disturbed by it. In other words, we're very conscientious about their quality of life. I think the difference is I'm willing to look at my food in the eye and do what needs to be done to eat. I understand the cycle of life and the food chain. 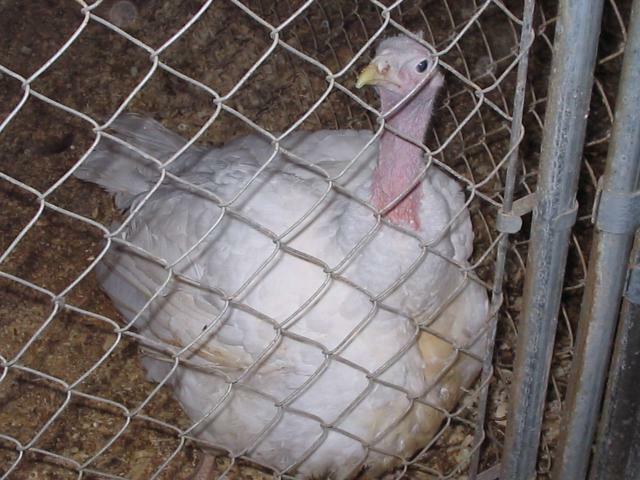 Quite honestly, Thanksgiving Henrietta wouldn't be alive if someone wasn't willing to purchase her as a chick for the precise reason of eating her when she got big. The American Indians had (and may still have) a ritual of thanking the creature who gave its life so that they could eat. I think it is important to acknowledge that life. I will often thank the animal for its sacrifice.